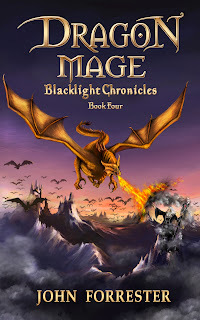 Introducing the fourth book in the Blacklight Chronicles fantasy series, DRAGON MAGE! The book is available right now on Amazon Kindle. In a world where dragons rule the sky, magic offers little resistance against the ancient King Valeron, Lord of the Dragons. Talis and Mara find themselves on the world of Vellia, home of Aurellia, the dark lord Talis is sworn to serve. Caught in a battle to overthrow the ancients of Vellia, Talis believes Aurellia and his forces are no match against their power. Aurellia and Talis fly out to the mountains of Ghaelstrom in search of an alliance with the dragons. Talis is separated from Mara, who is trained by Elder Relech in the art of assassination and magical stealth. Nikulo and Mara meet Goleth the Builder, who conjures the elements to form an armada of ships needed to carry Aurellia's army to assault the ancients of Vellia. But soon Mara realizes that she may never again see Talis, since her fate lies with the burden of killing a king.